22 - Beats, Iron Man, Thor, & Vision vs. The Phoenix Force - 2012 art by John Romita Jr. PLEASE SEE MY ABOUT ME PAGE FOR 1000'S OF PICTURED ART PAGES AVAILABLE. The image pictured is original art unless otherwise described. Such as: several comics can fit in one media box, as can more than one record. Multiple art pages can easily be combined because they are light and thin. For instance, two statues require a much bigger box. Same goes for CGCs, as the package gets bigger and heavier as you go. Ive had some bad experiences. You neednt worry; we are professionals who value your business and want your item to arrive safely as much as you do. I have been collecting for over 30 years. I send out items the way I would like to receive them. We operate out of two locations, so WH stands for Warehouse, an internal code for us to know which location the item is in. Have these CGCs had any previous owners? The image pictured is one of a kind original artwork unless otherwise described. 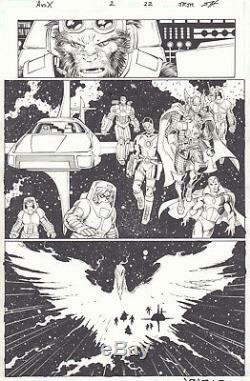 See ABOUT ME for 1000's of original art pages in stock. This # is text enabled as well. 22 Beats, Iron Man, Thor & Vision art by John Romita Jr" is in sale since Friday, June 03, 2016. This item is in the category "Collectibles\Comics\Original Comic Art\Interior Pages".